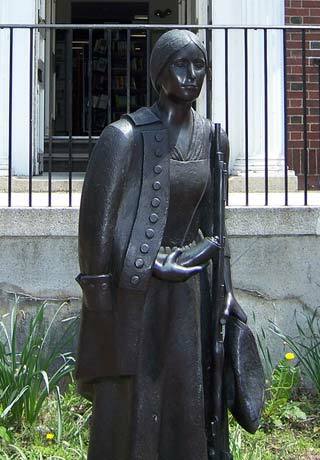 Statue of Deborah Samson Gannett at Sharon Public Library in Massachusetts; photo by Mike on Flickr (use permitted with attribution). Deborah Samson Gannett fought in the American Revolution as Robert Shurtleff (also spelled “Shurtliff” or “Shurtlieff”). She was recognized for outstanding service before she was wounded in battle (at which point her masquerade was discovered). Several other individuals are recognized as official symbols of Massachusetts: Ben Franklin (state inventor), Dr. Seuss (state children's author), Norman Rockwell (state artist), Johnny Appleseed (state folk hero), and Taj Mahal (state Blues artist).